Leads are automatically added to your IDX account each time a site visitor fills out one of your IDX contact forms. You can also add leads to your account manually by clicking Leads in the main menu, Leads in the submenu, and Create from the drop-down menu. 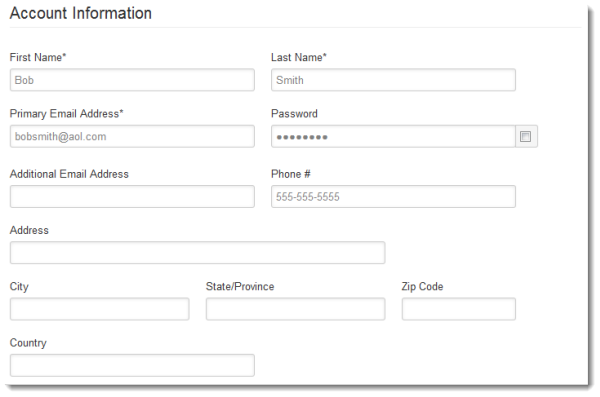 First, fill out the Account Information section with your lead's basic info. You can add as much or as little information about the lead as you would like. If your lead would like to receive emails to multiple accounts, just add an additional email address in this form. The only required fields are First Name, Last Name, and Email Address. Email Format - Choose the format for email updates sent to this lead. HTML is the recommended and most common choice. Assigned Agent - If you are subscribed to an IDX Broker Office account, you may assign the lead to one of your agents, so they can manage and follow up with the lead. Category - Select a category for the lead from the drop-down menu provided. Account Disabled - For a new lead, leave this option to No. If it is set to Yes, the lead will not be able to receive email updates. Lead Can Login - Leave this option on Yes if you would like the lead to be able to login to a Listing Manager account so they can save more searches or properties and view their Saves. Receive Property Updates - Leave this option on Yes if you would like this lead to be able to receive automatic email updates from IDX Broker with new listings. When you are finished filling out both sections, click Save Changes. Your lead is now stored in your account and viewable in the Lead Management screen. For more information on managing leads you have added to your account, please see this article on the Lead Management Screen.